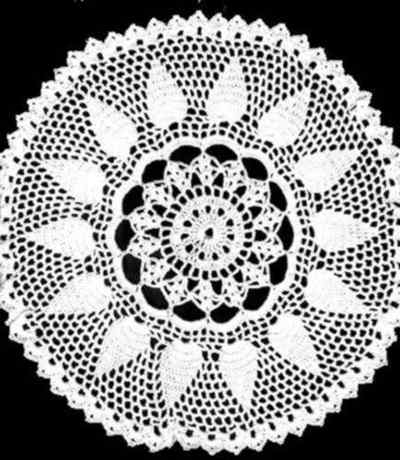 This is an easy, classic looking doily. Enjoyable when you crochet it, suitable to everybody's style! Stitches : ch, sl st, sc, dc, tr, shell =(2 dc, 2 ch,2 dc) in same st or sp; picot = 3 ch, sc on last st made. 2. * (dc in next tr) twice, 3 ch *; Repeat * to * 10 times more, join with sl st to first st.
6. sl st in first shell sp, * shell in shell, 6 ch,*;Repeat * to * 13 times more, join with sl st to first st.
7. sl st in first shell sp, * shell in shell, 4 ch,sc on 6-ch lp taking also the correspondent sps in 6th and 5th Round, 4 ch*; Repeat * to * 13 times more, join with sl st to first st.
8. sl st in first shell sp, * sc in shell sp, 12 ch,*;Repeat * to * 13 times more, join with sl st to first st.
10. * dc in next dc, 2 ch, sk 2 dc*; Repeat * to * 69 times more, join with sl st to first st.
11. * dc in next dc, 2 ch*; Repeat * to * 69 times more,join with sl st to first st.
12. sl st in first 2-ch sp, * dc in next sp, 2 ch ,sk a 2-ch sp, 13 dc in next 2-ch sp*; Repeat * to * 13 times more,join with sl st to first st.
13. sl st in first dc of 13-dc group, * (dc in next dc)13 times, 3 ch , sk a 2-ch sp, dc in next sp, 3 ch, sk a sp*;Repeat * to * 13 times more, join with sl st to first st.
14. sl st in first sp,dc, 3 ch * (dc in next dc)13 times,3 ch, (dc in next sp, 3 ch) twice*; Repeat * to * 12 times more,finish with (dc in next dc)13 times, 3 ch, dc in next sp, 3 ch,join with sl st to first st.
15. sl st in first sp,dc, 3 ch * sk a dc, (dc in next dc)11 times,sk a dc, 3 ch, (dc in next sp, 3 ch) 3 times*; Repeat* to * 12 times more, finish with sk a dc, (dc in next dc)11 times,sk a dc, 3 ch, (dc in next sp, 3 ch) 2 times, join with sl st to first st.
16. sl st in first sp,dc, 3 ch * sk a dc, (dc in next dc)9 times,sk a dc, 3 ch, (dc in next sp, 3 ch) 4 times*; Repeat* to * 12 times more, finish with sk a dc, (dc in next dc)9 times,sk a dc, 3 ch, (dc in next sp, 3 ch) 3 times,join with sl st to first st.
17. sl st in first sp,dc, 3 ch * sk a dc, (dc in next dc)7 times,sk a dc, 3 ch, (dc in next sp, 3 ch) 5 times*; Repeat* to * 12 times more, finish with sk a dc, (dc in next dc)7 times,sk a dc, 3 ch, (dc in next sp, 3 ch) 4 times, join with sl st to first st.
18. sl st in first sp,dc, 3 ch * sk a dc, (dc in next dc)5 times,sk a dc, 3 ch, (dc in next sp, 3 ch) 6 times*; Repeat* to * 12 times more, finish with sk a dc, (dc in next dc)5 times,sk a dc, 3 ch, (dc in next sp, 3 ch) 5 times, join with sl st to first st.
19. sl st in first sp,dc, 3 ch * sk a dc, (dc in next dc)3 times,sk a dc, 3 ch, (dc in next sp, 3 ch) 7 times*; Repeat* to * 12 times more, finish with sk a dc, (dc in next dc)3 times,sk a dc, 3 ch, (dc in next sp, 3 ch) 6 times, join with sl st to first st.
20.sl st in first sp,dc, 3 ch * sk a dc, dc in next dc,sk a dc, 3 ch, (dc in next sp, 3 ch) 8 times*; Repeat * to* 12 times more, finish with sk a dc, dc in next dc,sk a dc, 3ch, (dc in next sp, 3 ch) 7 times, join with sl st to first st.
21. sl st in first sp,*dc in sp, 3 ch* ; Repeat * to* all around; join with sl st to first st.
22. *dc in next dc, 3 dc in next sp, dc in next dc,3 ch, sk a sp*; Repeat * to * all around; join with sl st to first st.